I tried out the cupcakes at this local bakery stand inside the NewPark Mall (directly under the food court) after an open mic night with the Fremont Writers’ Club. The pretty, pretty cupcakes on display drew me in; I’m a sucker for a gorgeous cupcake, although the wares often don’t deliver on the visual appeal. It was nearing closing, so the owner saw me looking and enticed me over by offering a deal for the gigantic cinnamon rolls. I’m not a big cinnamon roll fan, so I countered with a two-for-one cupcake offer, which she happily accepted. Normally, the cupcakes are $3.50 each, so taking home an extra one for the husband at that price was great! The owner scurried back to their kitchen to frost them freshly, which she loves doing whenever the stand isn’t too busy. Meanwhile, I noticed they sell Marianne’s ice cream, and because I’m an UCSC alum, that earned Sugar High Dessert Dispensary another star in my book. So did the store’s whimsical name. Cupcakes secured nicely in a bakery tin, and I was on my way. Back home, the husband and I split the cupcakes in half. The owner had mentioned she uses fresh strawberries in the batter, syrup, and frosting for the strawberry cream cake, so that’s why I chose it. It was delightfully moist with lots of strawberry flavor. I was surprised at how much I enjoyed the frosting as well. She mentioned in passing that the frosting was nondairy, which brings to mind many forgettable birthday cakes from grocery stores. But in this case, it made for a silkier frosting with a bit of weight to it that I’m sure the lactose intolerant would appreciate. 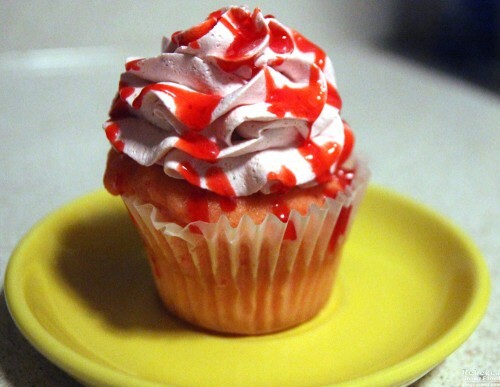 It was a fun change from buttercream or whipped cream for me. 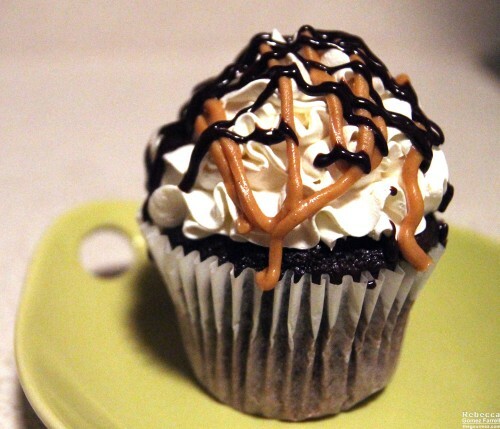 Our second cupcake, the Elvis, was chocolate with banana frosting and peanut butter swirls on top. The cake was moist again but not quite as notable in flavor as the strawberry one. However, the banana frosting was absolutely divine. Using peanut butter as more of an accent than the main draw was a good call. The frosting went down into the middle of both the cupcakes about an inch, which was a fun surprise. In the Elvis’s case, it also recalled the classic Hostess cupcake. 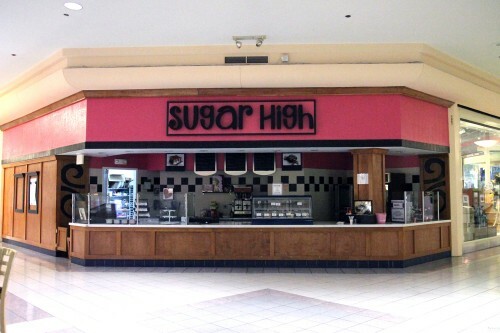 Let’s just say I am not at all unhappy to pass Sugar High on my way out of the mall once a month.